I was very fortunate to receive the support of the Anna Plowden Trust in 2006 and 2007, this enabled me to take up my place on the two-year MA Textile Conservation programme at the Textile Conservation Centre. The training and skills I gained, under the guidance of the experienced and knowledgeable staff of the TCC, enabled me to enter the textile conservation profession with confidence and enthusiasm. 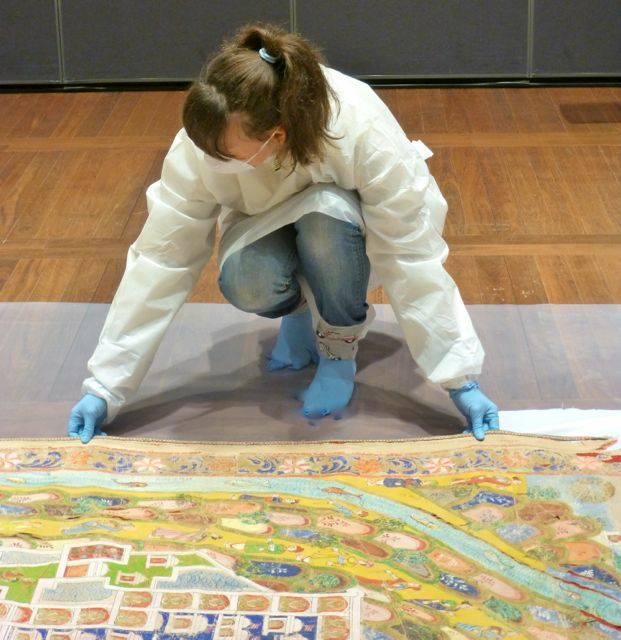 Since graduating from the Textile Conservation Centre I have been working as a textile conservator at the National Gallery of Australia, Canberra. I have just had two very busy years of major textile exhibitions including Southeast Asian and Ballets Russes shows. We have had the usual permanent gallery change overs in which I worked on an 18th Century Indian ceremonial cloth Patola which is extremely fine and beautifully made in silk and double ikat. I also dressed for display a number of Vivienne Westwood costume pieces in our permanent fashion galleries including her magnificent silk tartan wedding dress famously worn by super model Kate Moss on its catwalk debut. Currently the project keeping us most busy is the preparation for an exhibition entitled Divine Worlds showcasing the NGA’s Indian painting collection. The show will display Indian miniature paintings and some of the finest examples from the NGA’s Pichhavai collection; painted hanging textiles used in religious ceremonies. Outside of work I am embarking on some interesting adventures. In 2013 I traveled to Amman, Jordan for a language and cultural exchange program during which I worked on Widad Kawar’s extensive and extremely valuable Palestinian and Jordanian costume and textile collection. I also had the chance to experience traditional weaving and embroidery techniques with women still working in Amman using these textile traditions passed down through the generations. In preparation for this trip I learned Arabic here in Canberra at the Australian National University; I also took spinning lessons with the Canberra Spinners and Weavers and was able to practice some spinning in Amman.